Hair loss can be a scary thing. Your mind runs wild as you try to think of why your hair may be thinning or shedding excessively. Take a breath and ease your mind, because the professionals at Arizona Dermatology are here to help. We understand there are a great deal of reasons you may be experiencing the signs of hair loss, some more common than others. As professionals in the area of hair restoration, we want to not only help you, but to also educate you on the factors that may be its major influencers. The truth is, our hair plays an important role in our lives and must be properly cared for to avoid excessive damage or breakage. When it comes to our hair, there are a variety of colors, styles, and textures that require different hair care methods to maintain the look we want. However, our hair does more than just give us a desired appearance. It functions to maintain our body’s temperature and protect our scalp from the dangerous ultraviolent rays of the sun. People tend to underestimate the role of hair and all the benefits a full head of hair includes. Let’s begin with the basics and explain what exactly hair loss is and what causes it. Hair loss, also known as Alopecia, is a condition in which one loses hair from any area on the body. It is a common condition that almost everyone will have to deal with at some point in their life. Hair loss has affected both men and women of all ages. There are also different ways you endure hair loss, whether it’s slow hair thinning or a temporary loss of hair in the form of patches found around the scalp. Although there are ways you can prevent the early signs of hair loss, some causes are more difficult to handle than others. Many people set limits on this condition by only relating hair loss to the scalp but fail to realize hair loss includes the smallest of hairs, including the eyebrows and eyelashes as well. Baldness is specifically related to the hair loss on the scalp and is typically viewed as a severe problem for men. We grow hair everywhere on our body except the palms of our hands and soles of our feet. While you may not think this is true, some hair strands grow so fine and lightly colored that you may not be able to see them with the naked eye. The hair cycle is composed of three basic stages from beginning to finish. Anagen is the stage in which the hair is actively growing inside the hair follicles. While in this phase, your hair grows up to 1 cm every month or so. Although this growth phase typically last from ages two to six years old, the amount of time a hair follicle remains is up to each person’s individual genetics. Catagen is the shortest stage out of the three lifecycles of hair. Occurring at the end of the anagen stage, the once active hair follicle stops producing hair for usually 2-3 weeks. Eventually the hair that was growing stops and remains cut off from your blood supply and cells. Although the hair stops growing, it does not necessary fall out of the scalp during this stage. The last phase of hair growth is the telogen phase. Your hair follicle is now resting in this stage and is most vulnerable to any influencers that may lead to hair loss. Over a two to four month span, your hair will begin to fall from your hair follicle. These are the hairs you normally find falling out while washing or brushing your hair. Ultimately, new hairs begin to form and the hair follicle will slowly enter back into the anagen phase. What are the signs of hair loss? Some of these are less severe than others, but you have to recognize the problem before taking the right steps to prevent it. If you suffer from a significant amount of hair loss in a short period of time on any part of your body, contact your doctor for further diagnosis. Everyone will experience some form of hair loss throughout their lifetime. There are a lot of factors that play a role in hair loss, making it hard to determine the possible causes for such a frightening problem. When you rule out the possibility of hair loss being a genetic issue, you sometimes don’t know where to begin narrowing down the probable causes. On average, everyone loses 50 to 100 hairs daily. This number may differ depending on factors such as an individual’s age, hormone balance, and your own personal hair growth cycle. Identifying potential factors that may cause your hair to thin or shed excessively is the first step to fixing the problem. Here are a few common and uncommon reasons as to why people may suffer from hair loss. Does anything influence hair loss? The effects of hair loss can impact a person’s relationships, emotions, and social life. In addition to the feeling of lower self-esteem, hair loss can increase stress and even cause depression, both of which are also common causes of hair loss. The impact of hair loss differs greatly between men and women. Nobody should have to live with thinning hair or embarrassing shedding while in public. This is why it is important to identify the causing factor(s) and take necessary action to find an effective solution. How can Arizona Dermatology help? 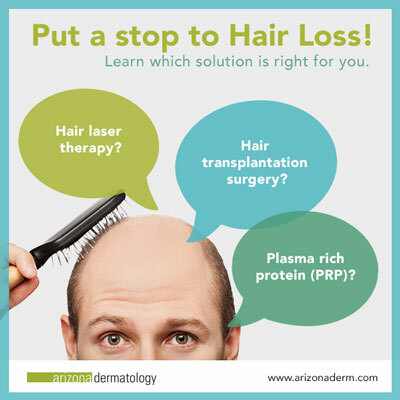 Arizona Dermatology offers advanced hair restoration services to help find the final solution to your common, or not so common hair condition. There is no better time than now and with the advanced treatments and technology available to you, hair restoration is easier than ever. Both men and women experience hair loss which makes everyone a candidate for hair restoration surgery. A hair transplant shouldn’t look like a transplant, it’s as simple as that. Often times, the hairs on the back of the scalp are less affected by hair loss and thinning than the hairs on the top of the scalp. During hair transplantation surgery, we remove hairs that are located in fuller areas of the scalp and “transplant” them to areas more affected by hair loss. The targeted area for hair restoration could involve hair that has thinned overtime or in areas that you may be completely bald in. By strategically inserting each hair follicle in its new location, we can mimic natural growth and create a pattern that looks like a genuine hairline. As time goes by you will notice your hair continuing to grow like normal hair! What is hair laser therapy? Hair laser therapy, also known as low-level laser therapy (LLLT) uses advanced technology to alter the cellular function of your hair. The light emitted from the laser increases your blood flow to help speed up the delivery of nutrients throughout your body. This gives your cells a natural boost of energy which ultimately maximizes your hair growth. Hair laser therapy doesn’t stop there, because stimulating the body’s cellular activity not only promotes the growth of new hair, but the feel and texture appears stronger and healthier all around. What is plasma rich protein? Plasma rich protein (PRP) is conducted on females and males to help restore hair loss. This incredible protein is packed with numerous growth factors to enhance the growth of miniaturized hair follicles. The PRP injections increase cell regeneration and stimulates hair follicles to grow at a much healthier rate. Patients who choose PRP as a solution to hair loss are usually experiencing hair loss currently and want to prevent it from occurring further. Hair restoration just got easier by finding us, a practice filled with a surgery team who has been perfecting hair restoration surgeries for years! Not only will we help you choose the best hair loss treatment fit for you, but your budget and schedule as well. We care and want to make sure your hair restoration journey is a positive one. Let us take the first step into hair restoration together and come in to Arizona dermatology today to receive a head full of natural, healthier growing hair you’ve always wanted.